Search Engine Land shared yesterday about a tip they received from Anthony Avolio who made the observation that Google was showing ads on Maps on the iPhone. This raises an interesting question – what is the relationship this represents between Google and Apple. Obviously, the standard map on the iPhone is an Apple app. However, with Google sponsored links showing up on the map, there certainly has to be some sort of agreement happening behind the scenes. The Next Web has speculated that Google is actually spamming the iPhone Map. I find this highly unlikely because of Apple’s control over the technology and app management of the iPhone. A much more likely scenario would be an ad revenue sharing agreement. 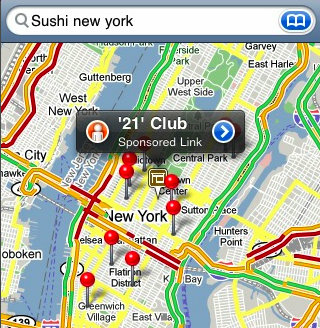 Apple allows Google to display sponsored links on the iPhone Map App – and Apple in turn gets a cut in the ad revenue. This scenario sounds like a great business deal arrangement for both Google and Apple.